Home > Shop By Brand > Griot's Garage Car Care for the Perfectionist > Griots Garage Rubber Cleaner 128 oz. Well-dressed rubber starts with Rubber Cleaner! Griot's Garage Rubber Cleaner cleans rubber tires, trim, and hoses to prepare them for a coat of protectant. Rubber dressings bond better with clean rubber. Start with Griot's Garage Rubber Cleaner and your vehicle's rubber surfaces will cleaner and newer. The Griot's Garage line includes two rubber cleaners: Rubber Cleaner and Rubber Prep. Griot's Garage Rubber Cleaner is formulated for regular cleaning of rubber surfaces. It removes everyday grime, oils, and silicones. Griot's Garage Rubber Prep is a more intense cleaner for heavy soil and silicone buildup. If you want to maintain clean tires and trim, use Griot's Garage Rubber Cleaner every time you detail to remove old rubber protectants, dirt, and oils. When you start with clean rubber, dressings and protectants bond better and look better. Use Griot's Garage Rubber Cleaner on rubber moldings, trim, tires, hoses, and seals. Old tire dressings containing silicone can cause rubber to turn brown and feel sticky. Dirt and oils stick to silicone dressings like magnets! Griot's Garage Rubber Cleaner removes silicones, waxes, and grime to uncover the actual rubber. This quick prep step makes all the difference in the results of your rubber dressing. Rubber and vinyl dressings tend to last longer and look darker on rubber that has been previously cleaned. You'll see a noticeable difference. Griot's Garage Rubber Cleaner even removes wax and sealants from rubber trim and moldings! You'll have dark, clean rubber from bumper to bumper, top to tires. Griot's Garage Rubber Cleaner cleans tires, rubber trim, and moldings. Griot's Garage Rubber Cleaner is safe and biodegradable. Use it as needed to prepare your vehicle for a fresh coat of rubber and vinyl protectant. Spray Griot's Garage Rubber Cleaner directly on the surface, or onto a towel if you're applying it to a narrow strip of rubber. Wipe down the rubber. Follow up with Griot's Garage Vinyl & Rubber Dressing to protect the rubber and give it a dark, natural look. 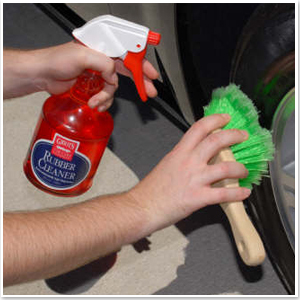 Griot's Garage Rubber Cleaner is the first step to clean, well-dressed tires and trim. If used as directed, this cleaner works great. I needed something that would remove the oily thick tire dressing without turning the tire brownish. This does well for this. You may have to do it twice but it leaves the tires nicely clean. I bought this to use on my 37'' Toyo M/T's and I was very pleased. It helps get mud and even got some stubborn clay off of my tires. Really makes a difference when you apply your tire shine. Griots Garage rubber cleaner is super. It cleans the tires quickly and easily, leaving them ready for tire dressing. I have tried several other rubber cleaner products but keep coming back to the Griots Garage cleaner.